The field reserved for pitches has open farmland on three sides, and the location and utilities have been approved by the Caravan Club. 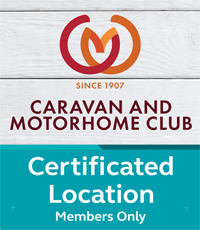 Our Certificated Location is open all year round and is in a secluded area at the rear of our Residential Park Homes, and located within our Touring Park. The CL Area has 5 pitches, all of which have 16 Amp electric hook-ups available. There is a brand new Shower and Toilet facility on site including Disabled and Laundrette facilities open to our Touring Park and Caravan Club Members. A fully stocked Carp Fishing Lake is located at the rear of the Campsite and is available on a Day Ticket or Seasonal Ticket, see Fishing for more information. A Children’s Playground is onsite and there is room for ball games. Tall Trees Touring Park has plenty of open space around the Campsite for walking dogs.